Is your partner constantly blaming you for things that go wrong in the relationship? Do they mock you or try to control you? Emotional abuse can creep into any relationship and often leaves the object of abuse with feelings of insecurity, guilt, and a lack of confidence. Emotional abuse is defined as a form of abuse, characterized by a person subjecting, or exposing, another person to behavior that may result in psychological trauma, including anxiety, depression, or post-traumatic stress disorder. Some signs are more obvious than others; however, it may be surprising they are not exclusively verbal. Your partner may use body language to control you such as refusing to talk, sulking, eye-rolls, patronizing you, and laughing at your opinion. 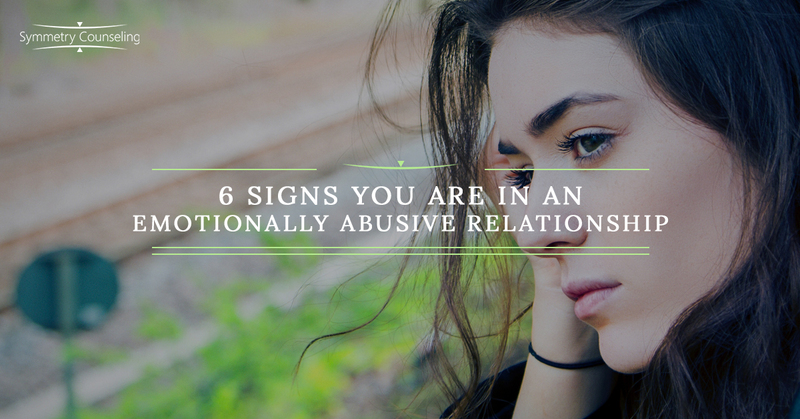 Below are six signs to be aware of, and if you recognize them, you may be in an emotionally abusive relationship. The abuser shifts the responsibility onto you for the problems in the relationship. They say things like: “It’s all your fault”, “What is wrong with you?”, or “Nothing I ever do is enough”. Constantly being blamed for the issues in the relationship bring feelings of guilt and shame. The emotional abuser will punish you by giving you the silent treatment. They may go days or possibly weeks without talking to or engaging with you. They refuse to listen, ignore your questions, and refuse to give information regarding their whereabouts. You may feel you did something wrong when you didn’t. Your partner severely and dishonorably criticizes you and then passes it off as “constructive” criticism. They may tell you your opinions are stupid or invalid and make fun of you in front of others to embarrass you. If you are the object of the abuse, you are told you have no sense of humor or that they are just trying to help, leaving you feeling guilty and unreasonable. The abuser uses a combination of distortion, blaming, stonewalling, and denial to obscure, irritate, and manipulate you. They deny the truth and distort your words, putting you on the defense. Their goal is to second guess you and doubt your truth and ability to reason. You are allowed only a short time to vent about things that upset you and you are expected to get over it rather quickly. They minimize your efforts, interests, hobbies, achievements, and concerns. Being with someone who has a lack of empathy leaves you feeling misunderstood and alone in your feelings. Emotional abusers make you hyper-vigilant because they constantly monitor your behavior. They keep you on a leash and you may feel you are “walking on eggshells” because you don’t want to upset them. If you go out without your partner, they may ask for a picture to prove you are not lying about who you are with. You feel like you are being monitored in more ways than one, and it eventually will cause issues in the relationship. It can be easy to excuse some of these signs as normal or not a big deal, but over time, these words and actions will leave you insecure, with low self-esteem, alone, and can severely impact your mental health. If you are currently experiencing any of these signs of emotional abuse and would like support, it may be useful to connect with a therapist. Contact Symmetry Counseling at 312-578-9990 to set up an appointment with one of our very skilled therapists at one of our two Chicago locations.